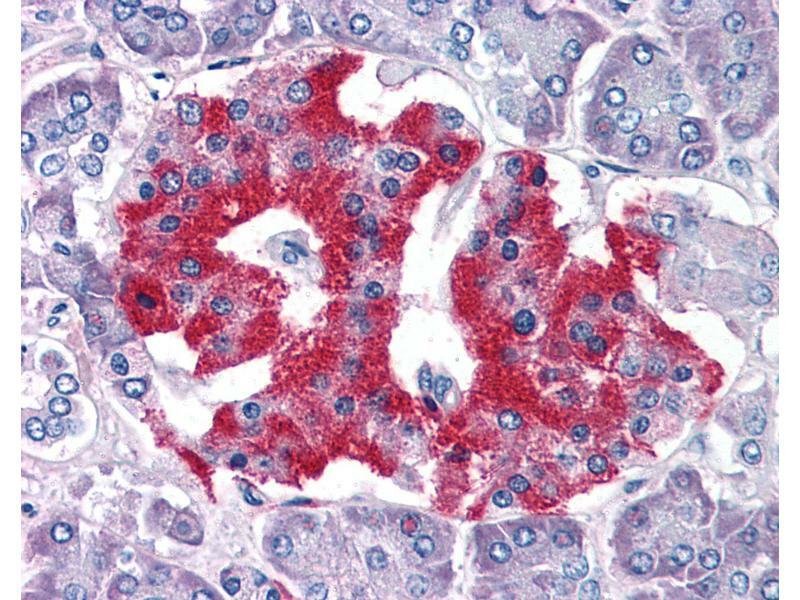 Anti-GRB2 antibody IHC of human pancreas. Immunohistochemistry of formalin-fixed, paraffin-embedded tissue after heat-induced antigen retrieval. Antibody concentration 5 ug/ml. Specificity Human GRB2. This antibody is expected to recognize both reported isoforms (NP_002077.1and NP_987102.1). Predicted Reactivity Percent identity by BLAST analysis: Human, Gorilla, Orangutan, Gibbon, Monkey, Marmoset, Mouse, Rat, Hamster, Elephant, Panda, Dog, Bat, Bovine, Horse, Rabbit, Pig (100%) Turkey, Chicken, Lizard, Xenopus, Salmon, Stickleback, Zebrafish (92%) Opossum (83%). Immunogen Synthetic peptide C-PRNYVTPVNRNV from the C-terminus of human GRB2 (NP_002077.1, NP_987102.1). Percent identity by BLAST analysis: Human, Gorilla, Orangutan, Gibbon, Monkey, Marmoset, Mouse, Rat, Hamster, Elephant, Panda, Dog, Bat, Bovine, Horse, Rabbit, Pig (100%), Turkey, Chicken, Lizard, Xenopus, Salmon, Stickleback, Zebrafish (92%), Opossum (83%). 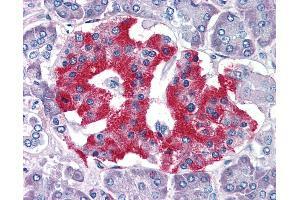 Usage: Immunohistochemistry: In paraffin embedded Human Tonsil, stains mantle zone andto a lessser extent germinal centre.